Throughout the United States, truck distribution businesses and their facilities serve to house, maintain and dispatch the trucks that carry the goods that sustain America's economy. In the midst of beginning to benefit from a recovering economy, these businesses are now confronting higher truck fuel prices and higher new truck replacement costs from mandated higher truck miles-per-gallon fuel efficiency requirements. In an industry jarring development, Wal-Mart, the retail juggernaut, has thrown down the gauntlet by directly entering the truck distribution segment in its own huge vertical market supply chain. As usual, Wal-Mart is focused on wringing out meaningful supply chain wide cost savings that will enable the company to continuously provide low cost products. To survive in this highly competitive market, truck distribution facilities need to lower all of their energy related operating costs by upgrading their facilities with current generation products while using Energy Policy Act (EPAct) tax incentives to accelerate the process. Pursuant to Energy Policy Act (EPAct) Section 179D, building owners or tenants, including truck distribution facilities, making qualifying energy-reducing investments can obtain immediate tax deductions of up to $1.80 per square foot. If the building project doesn't qualify for the maximum $1.80 per square foot immediate tax deduction, there are tax deductions of up to 60 cents per-square-foot for each of the three major building subsystems: lighting, HVAC and the building envelope. HVAC is the heating, ventilating, and air conditioning of a building and the building envelope is every item on the building’s exterior perimeter that touches the outside world including roof, walls, insulation, doors, windows and foundation. This prior generation T-12 and metal halide lighting is very energy inefficient as compared to today's T-8 and T-5 lighting, and a lighting retrofit can easily reduce lighting electricity costs by 40 to 60 percent. 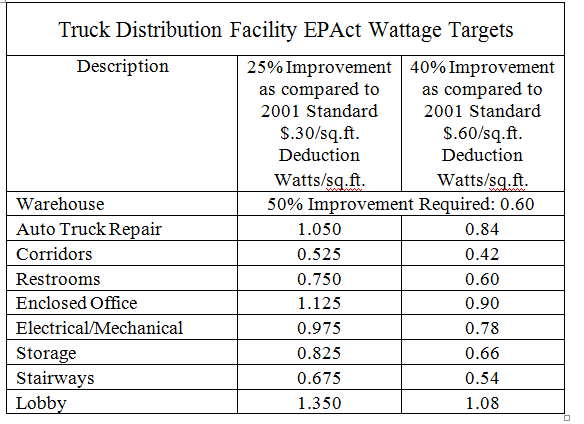 In addition to large energy cost reduction from the base building lighting, most truck distribution facilities undergoing lighting retrofits install sensors that completely shut off the lighting in portions of the facilities that are not in use. Previously, many truck distribution facilities owners and lighting specifiers were reluctant to install sensors because they reduced fluorescent lamp useful life. Today, improved technology sensors are available with warrantees not to reduce lamp useful life. New, improved commercial heating systems can provide energy cost savings of eight percent or more over the ASHRAE 2001 building code standards. There are multiple heater technologies suitable for the truck distribution facilities market, including direct fired gas heaters, unit heaters, and infrared (radiant) heaters. If feasible, the heater should be mounted on an exterior wall to optimize the roof top solar P.V. space. If a truck distribution facility requires re-roofing, this owner should consider a more energy efficient white roof. Moreover, when re-roofing, this is the ideal time to consider adding more insulation. If the building already had an energy efficient design and roof, the owner may want to consider upgrading to more energy efficient truck bay doors and windows. With this example, the maximum $180,000 EPAct tax deduction (100,000 sq ft x $1.80) will be available as long as the combined lighting, heater and roof project reduces total energy cost by at least 50% as compared to ASHRAE 2001. Recently, President Obama issued an executive order mandating more efficient large truck fuel mileage standards by 2014. The new fuel economy requirement for trucks is approximately 35 miles per gallon, and marks the first time that fuel use for large trucks has been regulated. Currently, medium and heavy trucks represent only 4% of vehicles on American highways, but account for 20% of the fuel burned. Owners of truck distribution centers should expect new trucks to have better fuel economy but to be more expensive. The new truck fuel requirements should also lead to increased use of biodiesel mixtures and other alternative fuels. Beginning in 2009 as part of the American Recovery and Reinvestment Act, the Alternative Fuel Infrastructure Tax Credit amount was extended to 50% ($50,000 cap) of the cost of installing the alternative fueling equipment. Therefore, as a result of the new fuel requirements, trucking companies seeking to increase fuel economy can do so by using alternative fuel and can receive a large tax credit for doing so. Owners of truck distribution facilities can also take advantage of exemptions to the federal heavy-truck excise tax by installing EPA approved idling reduction devices. Idling is when a truck is temporarily parked, such as at a rest stop; and idle reduction technology provides heat, air conditioning and/or electricity to the vehicle when otherwise the main engine of the vehicle would have to run. Examples of these types of devices are battery AC/heating systems, auxiliary power units, and thermal storage systems. Idling reduction devices can reduce fuel consumption by not requiring the engine of the truck to burn fuel while idle. This in turn can increase fuel economy and reduce truck distribution companies’ operating costs, on top of the excise tax exemption, once the new fuel requirements are effective. An energy cost efficient trucking distribution industry is crucial to the American economy. A combination of market developments, regulatory changes and new generations of truck and building equipment products can enable these businesses to substantially reduce their operating costs. Also, truck distributors who act on these fuel efficiency technologies should mention it in their engagement proposals since it is a way to distinguish themselves from their competition. Knowing how to apply the fuel related tax incentives and EPAct building related tax incentives can greatly assist these businesses. See Chris Burritt, Carol Wolf and Matthew Boyle, Why Wal-Mart Wants to Take the Driver’s Seat, Bloomberg Businessweek, May 27, 2010 <http://www.businessweek.com/magazine/content/10_ 23/b4181017589330.htm>. See Charles Goulding, Jacob Goldman and Malcolm Thomas, The Energy Tax Aspects of Warehouses and Distribution Centers, Corp. Bus. Tax’n Monthly, October 2009, at 15. See Charles Goulding, Jacob Goldman and Raymond Kumar, Large EPAct Energy Tax Deduction Opportunities for Commercial Heaters, Corp. Bus. Tax’n Monthly, January 2010, at 11.